This is the author’s 50th novel!! Shell is the kind of woman wives hate—for good reason—and most of them wish she would just disappear. But when she does, and a teenage girl is the only one who seems to notice, Annie can’t help but feel like someone should be looking for her. Last seen walking into the pine trees at the Fourth of July fireworks display, Shell has seemingly vanished without a trace. 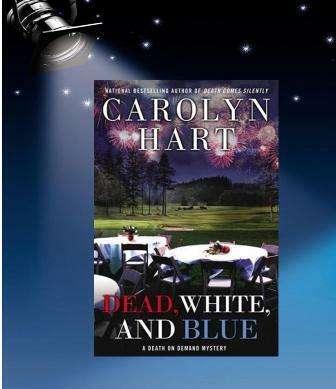 Carolyn Hart is a native of Oklahoma City, a Phi Beta Kappa journalism graduate of the University of Oklahoma, and a former president of Sisters in Crime. She is also a member of Authors Guild, Sisters in Crime, Mystery Writers of America, the International Crime Writers Association, the International Thrillers Association, and the American Crime Writers League. She taught professional writing in the University of Oklahoma School of Journalism from 1982-85. She is the author of 49 mysteries, winner of three Agatha Awards for Best Novel, two Anthonys and two Macavitys. To find out more about Carolyn and her books visit here webpage here. I have 1 copy to giveaway!! I have heard good things about this book. Love the cover and name. I love the title of this book and the play on words. Thank you for the chance to win it. This looks like a great mystery and I am so excited she has reached such a milestone! I’m a big fan of this series and own quite a few of them. I’d love to be the lucky winner of this latest edition to the series.